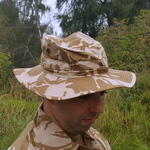 The classic DPM Jungle Hat is also available for use in arid operational areas. 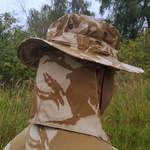 Sewn in loops around the crown were originally designed to hold local foliage or attached fabric for concealment. Mesh covered ventilation holes on each side allow the wearers head to breath. 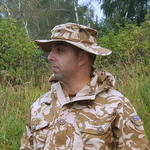 Attachment points are located underneath for an elastic or paracord lanyard to prevent loss and a velcro attached sun shade provides protection from the desert sun. These hats are no longer in production and so new and unissued ones, still in manufacturers wrapping are extremely rare now. Our stock is direct from Military war reserves and limited so order while they are still available. Available sizes in centimeters are shown on the drop down menu below.